Let's be honest, we're just talking here, would it be fair to say that our past experiences with refried beans from a can have been somewhat ho-hum? 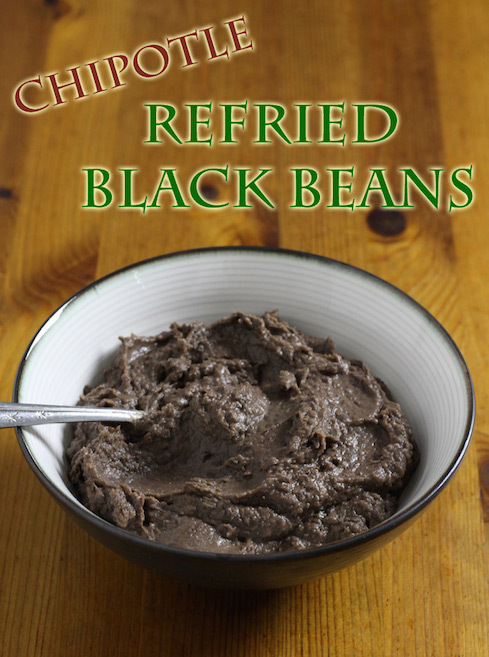 That's the way I feel about it, but I can't be sure whether my memories of refried beans past have been blandified by the flavour dynamite that I experience with this recipe. The source of the explosion is not difficult to pinpoint: it's the smoky heat of chipotle. My enthusiasm for this recipe comes partly from the disappointing outings that went into developing it. In no particular order, here are the lessons that I've learned about making refried black beans. 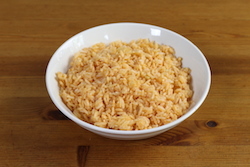 Start with dry beans; slowcook them with the spices; use 1 pound of dry beans and 4 cups of water, adding more only if absolutely necessary; let the mixture cool and absorb more spice after cooking it; and blend the cooked beans with the cooking water until beautifully smooth instead of mashing them. The most important lesson is using the blender I think. 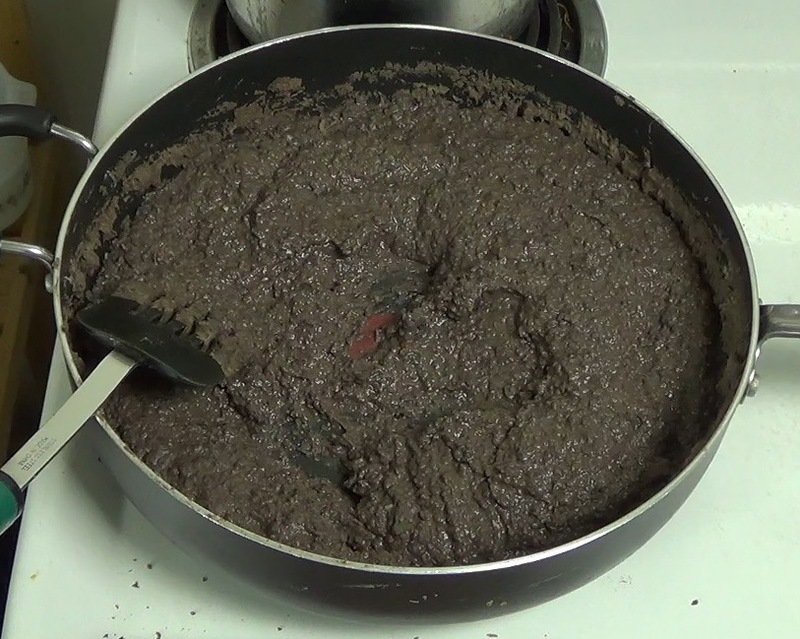 A lot of online recipes for refried beans will recommend some kind of mashing by hand. It may be more natural, but for me, the mashing technique results in way too much intact skin. 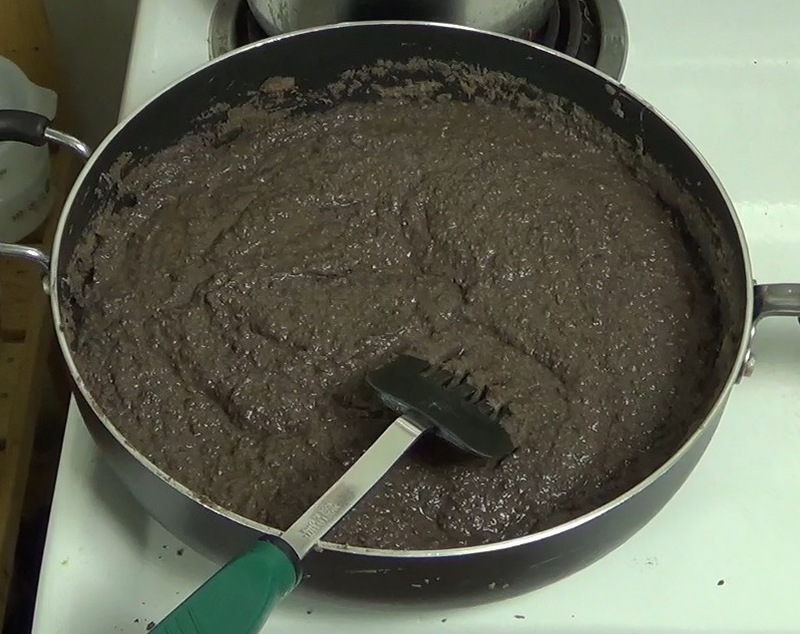 A smooth texture is part of the attraction of refried beans, and for that you need a blender. Since I've found these, I've been on a mission to find things to serve them with. Naturally, vegan tacos are delicious. The contrasting flavours of the beans with fresh, cool guacamole is really a magical synergy. I can be perfectly happy with a bowl containing just these two ingredients, getting a little of both in each spoonful. Of course, a whole wheat flour tortilla makes a beautiful minimalist burrito too. Scooping with plain tortilla chips is lovely as well. I admit that these accompaniments aren't the most imaginative—they don't need to be when the beans taste like this. I hope you like them too. 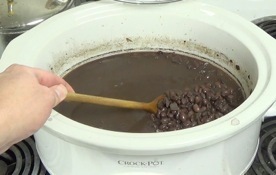 Soak the beans in a large bowl of water for at least 8 hours. Drain the beans, discarding the water, and rinse them well. 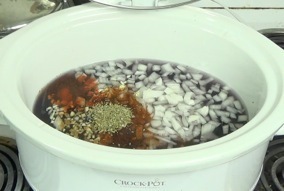 Put the beans along with all of the other ingredients except the oil and salt in a large slow cooker (mine is 6 quarts). Cook on high for 5-6 hours, checking occasionally for tenderness. The skin on the beans should mostly stay intact but they should be nice and soft when done. Add the salt at the very end and mix well. 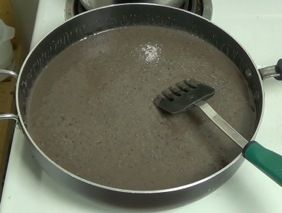 Let the beans cool until they can be transferred safely to the blender, or use an immersion blender if desired. If using a traditional blender, it may be necessary to work in batches. 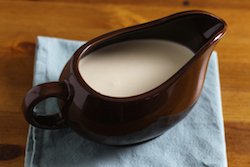 Place a collander over a large bowl and pour the bean mixture into the collander, capturing the liquid in the bowl below. Place the beans in the blender with some of the water, blend until utterly smooth and then add more liquid. In the meantime, warm the 2 Tbl of canola oil in a large, deep skillet over medium heat. When the beans are done, transfer them to the skillet. Mix frequently for the first 5-10 minutes until the mixture starts to steam, then reduce heat to medium low. Continue mixing every minute or so and watch the beans start to thicken. Continue simmering for 20-30 minutes, mixing as before, until the mixture thickens to the consistency of hot cereal. If you push it with the spatula, it should flow back, but slowly. The beans will continue to thicken, so keep them a little on the thin side. Transfer to a pot with a lid and keep covered on low heat so that the beans stay warm until everything else is ready.